Have you finished your degree or course? 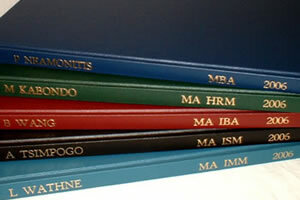 Do you need your thesis or dissertation bound as part of the requirement for your final qualification? Do you want the binding to reflect the amount of time and hard work you have put in to this document? Is it a PhD, MBA, MA, MA HRM, MSc, BA, or BSc ? or are you looking for a high quality alternative for your submission? Do you need extra copies for yourself, sponsors, family, or to show prospective employers? 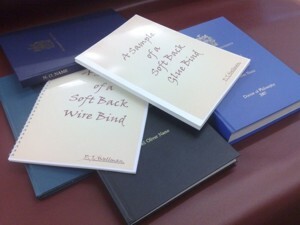 If the answer to any of the above questions is 'yes' we have several types of binding available to suit your requirements. Please phone to discuss your requirements or to book your appointment and avoid disappointment. Quantity discounts are available for organised groups of students or courses requiring the same type of binding. Please phone now to book an appointment as spaces can be limited.